With the 3D printed house created last year, developers have moved on to try and print something more challenging. Robot company MX3D has developed a revolutionary, gravity defying 3D printer that can print structures in the air. With this technology they are now planning on building a bridge over a canal in the heart of Amsterdam. Rendering of how bridge construction will proceed. "We research and develop groundbreaking, cost-effective robotic technology with which we can 3D print beautiful, functional objects in almost any form," MX3D wrote on the project's website. "The ultimate test? Printing an intricate, ornate metal bridge for a special location to show what our robots and software, engineers, craftsman and designers can do." The bridge will be designed by Joris Laarman, in a process using new Autodesk software. It will sync with the technical development and take into account the location. The robots will print using steel, with specially designed arms used to heat the steel to 1,500 degrees Centigrade before welding the structure into shape. This process will allow for the creation of structures that are strong, durable and functional - all things vital for a working bridge. "I strongly believe in the future of digital production and local production, in "the new craft". 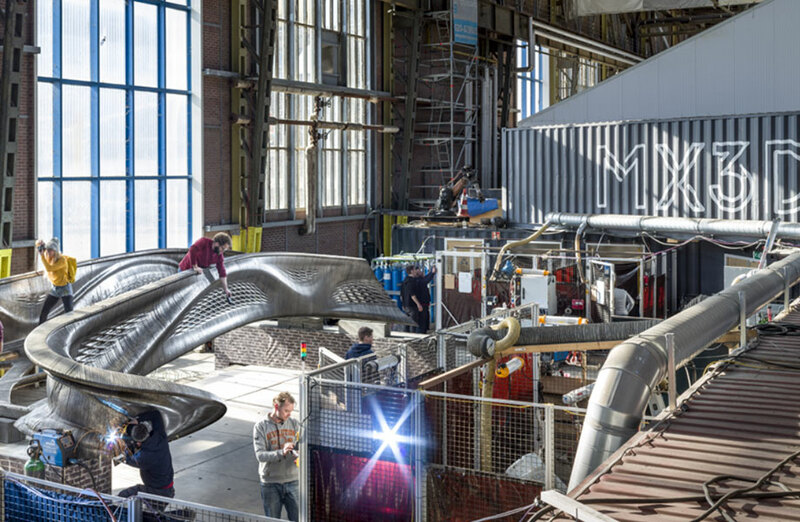 This bridge will show how 3D printing finally enters the world of large-scale, functional objects and sustainable materials while allowing unprecedented freedom of form," said Mr Laarman. "The symbolism of the bridge is a beautiful metaphor to connect the technology of the future with the old city, in a way that brings out the best of both worlds." According to CNET, the team has perfected and tested the robotic printer, creating a metal sculpture of intersecting lines. For the bridge, the team envisions two robots - with one robot on each side of the canal bank - working towards each other. We've already seen how 3D printed houses could potentially save millions and millions in construction materials and time, and the 3D printed bridge would be no different. It could make building bridges cheaper, faster and safer. View the project website here and see how the team at MX3D are going to print a bridge. Images courtesy of MX3D & Joris Laarman.